A meat-lover's guide to fabulous vegetarian cooking. 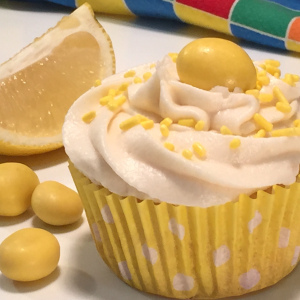 When Life Sends You Lemons…Make LEMON ZINGER CUPCAKES! My friend, George, thoughtfully bestowed upon me a bagful of lemons from his garden. As most of you know, once nature’s bounty has been picked, there’s only so long before those fresh and flavorful fruits and veggies turn into mushy fodder for the compost heap. So I needed to come up with some ideas to take advantage of these luscious lemons. There were the usual options of lemon cream pie, lemon bars, the obvious lemonade, and, of course, as self-proclaimed Queen of Freeze, I realized I could have just frozen the juice in ice cube trays and dealt with the dilemma later. Then it came to me: Lemon Zinger Cupcakes. I knew exactly what I wanted: a delicate cake crumb that packs a lemony wallop. I tried a couple of recipes that I found online, but they were rubbery, sticky, and didn’t have the lemon punch.